You’ve seen my closets. They aren’t that big. Here, I must express gratitude for having more than one closet. I don’t have as much space as some, but I have more space than others. I am not complaining. But you can see where I am heading. What do you do when your clothes fit, you love them, and you have no more space? A certain stasis might descend . . .
Do you remember my Best Suit? To keep it fresh, I had the arms taken off the jacket and made the dress into a crop top and miniskirt. No, I didn’t! You know me better than that. Are you insane? You think I would desecrate a suit made by knowing Italians? I did, however, want to put the suit to more use. 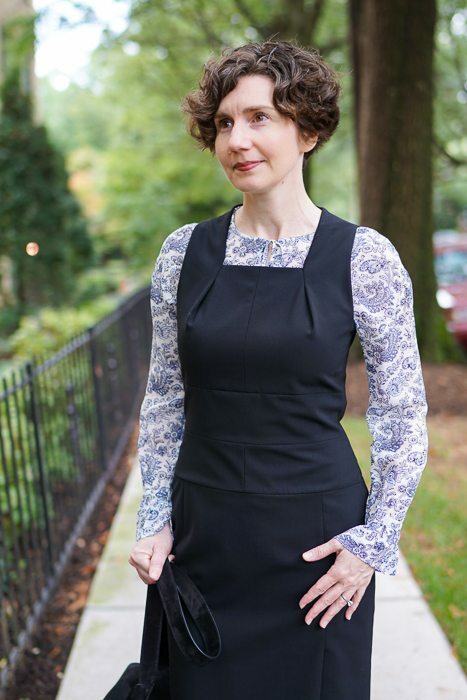 Here is the suit-dress with a blouse underneath. 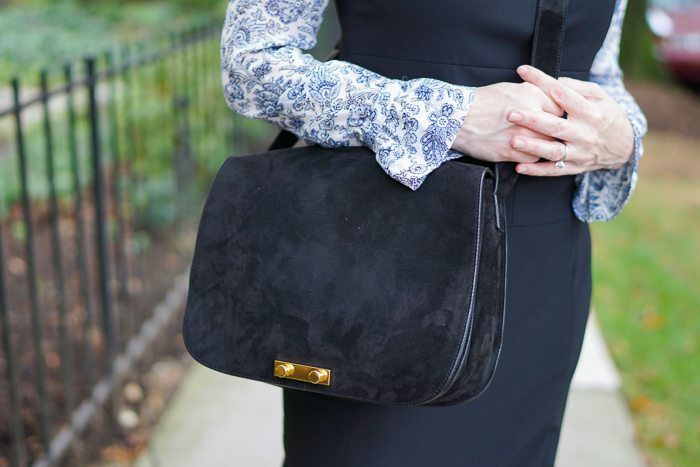 This vivid blue paisley/floral blouse adds a crisp, graphic element to the dress. A whole new look for this beautiful dress! Low, block heels provide polish — and are another change from the way that I usually wear this dress with kitten heels. Are you sure those are pleats, and not tucks? The dress is a solid, but not plain. Beautiful seaming defines the waist and bodice and the square neckline is beautifully shaped by on pleat in each corner. Come closer for a better look. Finishing things off, my suede satchel, which still needs to be Fatimalized. This black suede is so deep and dark. Must. Remember. To. Waterproof. Bag. It’s providential that you considered the dress again and gave it a new look with more warmth and character rather than discard with boredom. 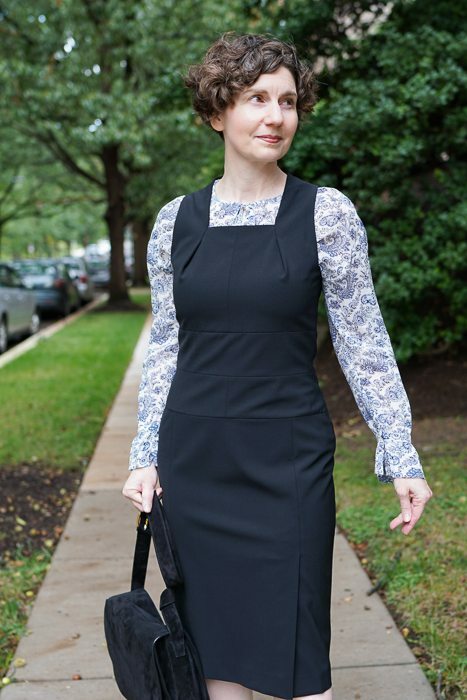 The dress is so worth the effort as it fits you well and looks great in its new life. The shoes are perfect with it. A choker of pearls? Sets off your face. To be honest, this is not my favorite look. 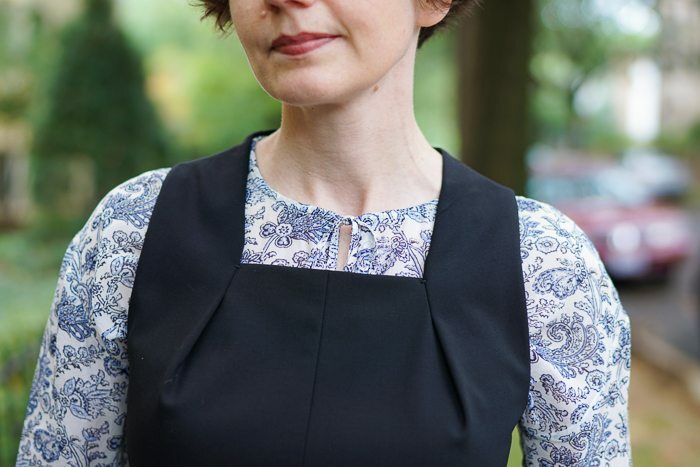 I think the round neck of the blouse detracts from the incredible tailoring of the square-necked suit dress, and the tiny print looks like a pajama top from afar. Very interesting . . . I thought a soft, round neck was the only sort that would work in the square. But I hear you. Fortunately we have so much common ground, Bette! Those pleats are wonderful! What a good thing you have found a way to show off this wonderful dress, unobscured by the jacket. I bought that blouse after you featured it the first time and absolutely love it! It fits my decidedly casual office too. Hugo Boss is german, not Italian? I am so foolish! You are correct. I am not sure where my confusion arose. (Hugo Boss is not an Italian-sounding name.) Fortunately, love for Hugo Boss (beautiful, serious work clothes) and love for Italian labels (the ones I’ve found on YOOX are so chic) are not mutually exclusive!